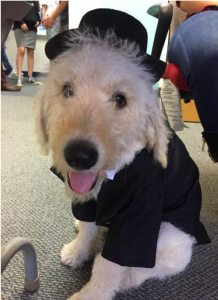 Hello, I’m Thor, also known as Huckleberry, ODA (Oxford Day Academy – get it?! ), or Thorckleberry. Whatever name you choose to call me, just know I am the ACE Poetry Contest Mascot for Oxford Day Academy, located in East Palo Alto. The newest member to join the ACE Poetry Contest Mascot Honor List. I’m Thor. I dig poems associated with thunder, lightening and protection of mankind. Did I say…? I’m Thor!! !